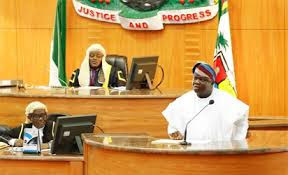 The Lagos State House of Assembly yesterday urged Governor Akinwunmi Ambode to appear before it within one week on the controversy concerning this year’s budget. The 2019 Appropriation Bill has not been presented to the lawmakers, causing hot disagreement between the Executive and the Legislature. Last month, the governor sent the budget to the Assembly against the tradition of laying it before the Assembly. Speaker Mudashiru Obasa told his colleagues at yesterday’s plenary that it was important to give the governor a fair hearing on the budget. The Speaker recalled that there had been violations of the Constitution and alleged infractions by the governor. He said: “The Attorney General, the Finance Commissioner and Commissioner for Budget and Economic Planning, who ought to have advised the governor did not do so. “The most important thing is that we should let the people know that a budget that was yet to be approved was being spent. This was why we could not attend to the governor on the budget on January 21. “We must give them a fair hearing to come and explain what happened. The point has been made that there must be something before the Assembly before you can commence expenditure. We want to call on the governor to come within a week to explain himself along with the other officials.